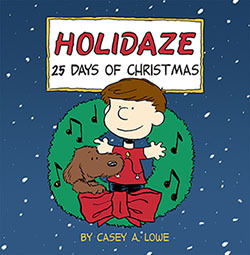 Holidaze: 25 Days of Christmas is a full-color collection of holiday-themed comic strips created as an homage to Charles M. Schulz's iconic Peanuts strip. These comics--inspired by Charlie Brown, Snoopy, and the gang--were created, written, and illustrated by Casey Lowe during the 2012 Christmas season. All comics are based on a Christmas song and were originally published over the Internet via Facebook and other sites. Collected here for the first time in print form are all twenty-five daily comics (including four full-color Sunday strips), as well as four never-before-seen comics and brand new artwork created just for this collection. This book was designed to be gifted and includes a To/From page in the front. N.E.R.D.I. 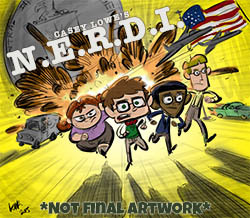 is a graphic novel in development by writer and illustrator Casey Lowe. SYNOPSIS: In recently declassified documents, it has been revealed that in the 1950's & 60's, during the era now known as the Cold War, the United States government had a secret espionage unit within the C.I.A. labeled the Nimble and Enlightened Research Division Initiative, or N.E.R.D.I. Their goal was to help protect the country and develop new technology and ideas through the Nation's greatest natural resource: it's children.